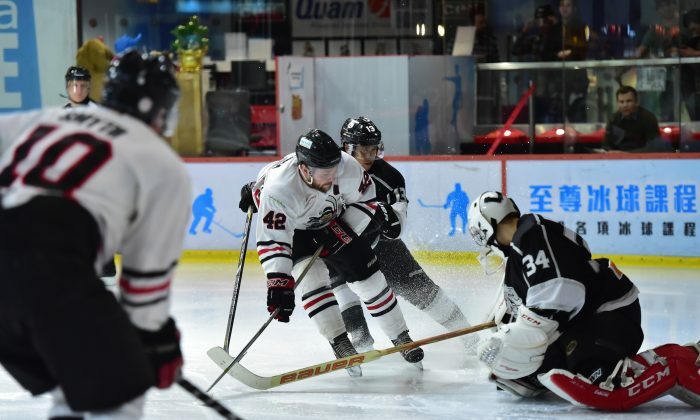 HONG KONG—With the regular CIHL season matches complete the final ranking of the teams shows South China Sharks way out in front in the standings with 26 points, Macau Aces second on 17 points, Hong Kong Tycoons a close third with 16 points and Kowloon Warriors bringing up the rear with 10 points. The pairings for the playoffs are therefore Sharks against Warriors and Aces against Tycoons. On first of 3 playoff nights on Thursday March 24, a good sized gallery attended eager to see if the Warriors could raise their game, as they did from a similar position last year to get their noses in front. They also keen to see the outcome of the match-up between the closely ranked Aces and Tycoons. The results of the Sharks to Warriors matching through the season were heavily one sided at 6-0 to Sharks. In the first playoff match the result continued to flow in the Sharks favour. Sharks were not in the mood to play easy and struck with goals from Blake Steele and Steven Lai in Period 1. Things only got worse for the Warriors as Sharks piled on the agony in Period 2 notching up a further 5 goals with Steele and Lai adding to their Period 1 scores, Kirk Golden struck twice and Jordon So also got on the score sheet to make it 7-0 at the ice cleaning break. After the interval, Reto Broemmimann scored in the first minute and Jordon So added his second in the 3rd minute, before Warriors finally got on the scoresheet from a surging attack by Gregory Smyth. But it was just a consolation goal as So and Golden pushed home their superiority to make the final score 11-1. It looks difficult for Warriors to regroup and hit back after such a big defeat. The strength of the Sharks attack is highlighted by 5 different players getting on the scoresheet. In the second game of the evening slight underdogs Tycoons rose to the occasion edging the first period 2-1 with goals by Partick Waller (2) and Christopher Antonelli against one conversion by Aces by Jeff Ceccacci. Tycoons continued their good form into session 2 with strikes by Lucas Eshleman and Patrick Henderson to give Tycoons a 5-1 advantage going into the break. Although Loei Wang got a goal for Aces in the 4th minute of the final stanza Scott Nicoll, scored twice and Eshleman added to his score making the result 8-2. Aces looked a little out of salts and things did not go their way, but they still have time to regroup and try to win the next match to push for a decider in week 3. The top five goal-scorers in the regular season were Lucas Eshleman of Tycoons (28), Whitney Olsen of Aces (24), Kirk Golden of Sharks (23), Jeff Ceccacci of Aces (19) and Jordan So of Sharks (17). Overall player ratings taking into account goal assists is the same except Olsen drops to 4th place. Rounds 2 and 3 of the Playoffs are scheduled for April 7 and April 14 with the final between the winners planned for April 21.